After a few separate leaks in Japan, it seems that the LG Optimus G Pro is coming out sometime soon, but whether or not it hits US and Europe is unknown. We suspect that LG are looking for a Japanese launch first, with the success of the previous Optimus G in Japan. We have heard rumours of an LG Optimus G2 and that may be in the pipeline for the company, and the Optimus G Pro may just be an incremental upgrade from the predecessor, to match the top-tier mobiles right now. 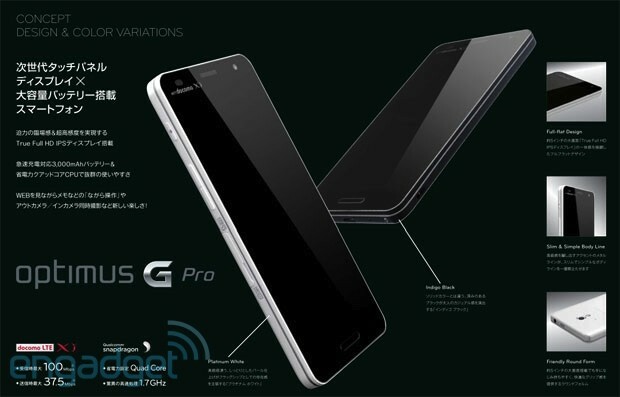 The Optimus G Pro will be launched on the Japanese carrier NTT Docomo and no other carriers have been listed. This is why we believe the phone may be a Japanese only and the US and Europe will have to wait for the Optimus G2, that could come out this summer. The smartphone will feature a quad-core, 1.7GHz Qualcomm Snapdragon S4 Pro processor , with 2GB of RAM and 32GB of onboard storage. This is all very common and good, we expect that the Optimus G2 will have a Tegra 4 or Snapdragon S800 processor, or maybe they will go for an eight-core processor. Big improvements on the Optimus G Pro are a larger 5-inch, 1080p HD screen and a 3,000mAh battery to counter the impressive and power consuming screen. The phone will also come with a 13MP rear camera and a 2.4MP front facing camera. The phone will come in two different colours, “Platinum White” and “Indigo Black”. The Optimus G Pro is, like we have said, an incremental upgrade, to match the top tier phones that have just been released. We suspect that LG will test this smartphone out in Japan and if response is good, then they will move to US and Europe. The problem for us is that, if you look at top Android smartphones, almost all them are just incrementally upgrading their products. We want to see another 2007 “revolution” in the phone industry, and right now, things are getting a little stale.